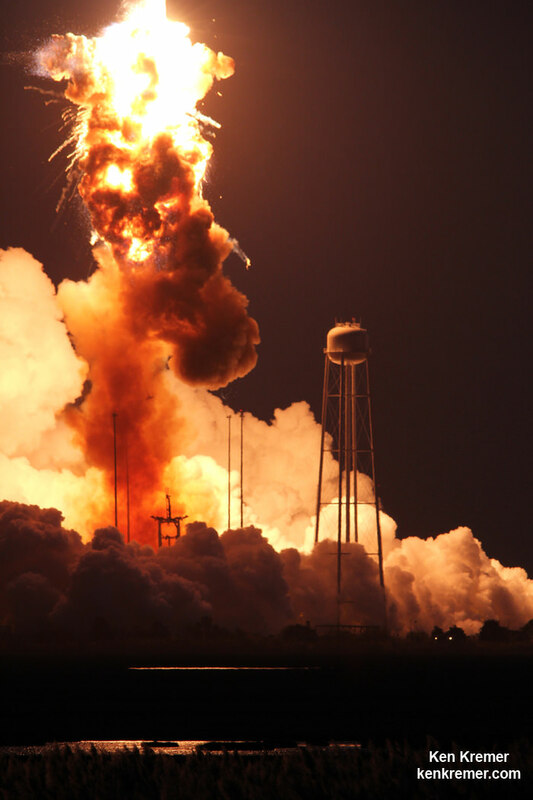 One year after the catastrophic launch failure of Orbital ATK’s private Antares rocket seconds after liftoff with the Cygnus cargo freighter bound for the International Space Station (ISS), the firm is well on the way towards revamping the booster with modern new engines and implementing a ‘Return or Flight’ by approximately mid-2016, company officials told Universe Today. Antares is on the comeback trail. 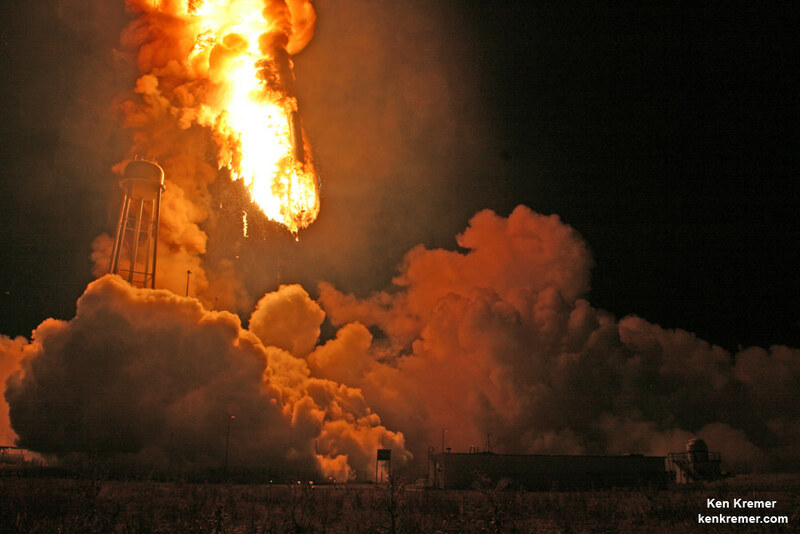 Some 15 seconds after blastoff of the firms Antares/Cygnus rocket on October 28, 2014 on the Orb-3 resupply mission for NASA to the space station, the flight rapidly devolved into total disaster when one of the rockets first stage AJ26 engines suddenly blew up without warning after liftoff from NASA Wallops Island facility along the Eastern shore of Virginia at 6:22 p.m. ET. After thoroughly investigating and evaluating the causes of the Orb-3 disaster, the top management of Orbital ATK decided to scrap further use of the suspect and troublesome Soviet-era built and ‘Americanized’ AJ-26 engines and upgrade the Antares rocket by powering it with the new Russian RD-181 main stage engines and a modified first stage core structure. “Orbital ATK is now targeting blastoff of the upgraded Antares rocket by around the latter part of the first half of 2016,” said Frank DeMauro, Orbital ATK Vice President for Human Spaceflight Systems Programs, in an exclusive interview with Universe Today. “The launch could take place by perhaps the late May to end of June 2016 timeframe,” DaMauro said, emphasizing that’s an approximate time period. Cognizant of the firms responsibilities to NASA and to the crews serving aboard the ISS, Orbital ATK quickly committed to fulfill its station resupply contract commitments in the wake of the Cygnus Orb-3 mission failure. I was an eyewitness to the failure and watched the disaster unfold from the press site less than 2 miles away. Therefore, in order to get the Cygnus logistics spacecraft back into service for NASA as quick as possible, Orbital switched rockets and the vessel will be carried to orbit for the first time by a United Launch Alliance Atlas V rocket – now slated for liftoff on December 3, 2015 from Space Launch Complex 41 at Cape Canaveral Air Force Station in Florida at approximately 6 pm. ET. Orbital ATK holds a Commercial Resupply Services (CRS) contract from NASA worth $1.9 Billion to deliver 20,000 kilograms of research experiments, crew provisions, spare parts and hardware for eight Cygnus cargo delivery flights to the ISS. “We are confident on the Dec. 3 launch date. And ULA is doing really well on the launch vehicle side,” DeMauro told me. The resupply flights from Orbital ATK and rival SpaceX are the essential lifeline to the station, without which it cannot exist. The cargo missions stock the station with all manner of equipment, science experiments, food, clothing spare parts and gear for the international crews of six astronauts and cosmonauts. Antares ‘Return to Flight’ next spring is contingent on successfully completing a huge amount of prelaunch assembly, testing and processing activities and conducting a critically important ‘hot fire’ engine test of the rocket on the boosters launch pad 0A at NASA Wallops. Antares rockets are assembled for flight inside the Horizontal Integration Facility (HIF) at NASA’s Wallops and rolled out to the pad, located about a mile south. Repairs totaling some $15 million have been completed to Wallops Pad OA, that resulted from the Oct. 28, 2018 Antares launch failure. Testing and certification of the launch pad is nearly complete. The pad was originally constructed with reinforced concrete to conduct full power engines test for 30 seconds duration. “Operations in the Horizontal Integration Facility (HIF) at NASA’s Wallops Flight Facility where Orbital ATK assembles and tests its Antares medium-class rocket are in full force as the team preps the upgraded vehicle for its upcoming “hot fire” test in early 2016,” according to Orbital ATK officials. Orbital will move forward with Antares launch preparations for CRS mission to the space station after successfully completing the hot fire test. All the other components of the upgraded Antares rocket including the core stage, second stage, payload fairing have already arrived at the HIF and are being assembly into the test fire configuration. “We have the engines and other major subsystems installed and are preparing to begin integrated testing of the first stage,” said Mike Pinkston, Orbital ATK Vice President and Antares General Manager, in a statement. Meanwhile, as technicians prepare the Antares hot fire vehicle they are also assembling the Antares return to flight rocket which will have greater thrust compared to the original Antares. The key milestone was to successfully re-engine Antares with a new type of first stage engine that completely eliminates use of the original AJ26 engines from Aerojet Rocketdyne that were refurbished 40 year leftovers – the NK-33 from Russia’s abandoned manned moon landing program. After the Oct. 28, 2014 launch failure, Orbital managers decided to ditch the trouble plagued AJ-26 and “re-engineered” the vehicle with the new RD-181 NPO Energomash Russian-built engines that were derived from the RD-191. As Antares moves toward its ‘Return to Flight’ next spring, the Cygnus ‘Return to Flight’ mission, dubbed OA-4, is imminent. The Dec. 3, 2015 mission starts to fulfill Orbital ATK’s commitment to “meet our cargo requirements to NASA under the Commercial Resupply Services (CRS) contract. 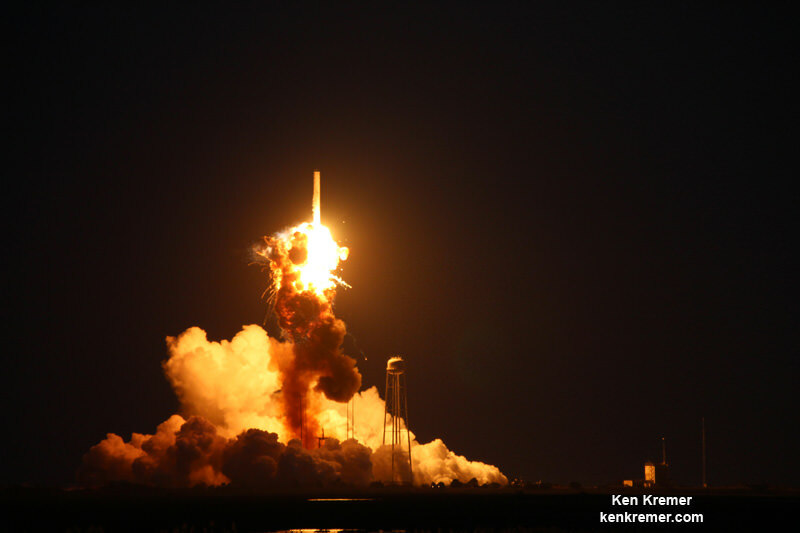 Commercial competitor SpaceX also suffered a launch failure this year in June 2015, following the CRS-7 ISS resupply liftoff from Cape Canaveral. So NASA desperately needs both commercial cargo partners to safely resume station resupply launches as soon as practical. I was an eyewitness to both calamities and plan to be onsite at the Kennedy Space Center press site for the OA-4 liftoff on Dec. 3. Too bad they’re still using Russian rocket engines for the first stage. As long as the RD-181’s don’t have the word “Phobos” in their long form name, it’s still a lot better than having to launch relying on giant trampolines. The ‘roll of the dice’? If that failed engine had instead been used on the original Russian N1 rocket it MIGHT have gone KA-BOOM-SKI long ago? When that rocket exploded so did the Russian lunar mission. I wonder if both engines could have had the same fault?